The US Food and Drug Administration has approved the first contact lenses for extended wear for up to thirty nights of continuous wear. Soft continuous wear contact lenses are the most significant advancement in contact lens materials since soft lenses were introduced more than 40 years ago. Commitment to innovation has produced a breakthrough product that delivers what lens wearers want – convenient, continuous vision correction that easily fits with their busy and unpredictable lifestyles. Because they can be worn continuously for up to 30 nights and days, these soft contact lenses can eliminate the tedious, daily hassles of inserting, removing and cleaning lenses. Lenses are simply discarded after a month of providing clear and comfortable vision around the clock. Continuous wear contact lenses are also a good alternative to laser vision surgery for the millions of individuals who desire around-the-clock clear vision but who are not good candidates for the surgical procedure or who are adverse to it because of its high costs, invasiveness, non-reversibility and potential complications. These lenses are made from a revolutionary new silicone hydrogel material that supplies six times more oxygen to the eye than ordinary disposable contact lenses and 40 percent more oxygen than the minimum threshold recognized by independent researchers for overnight wear of lenses. The unique, biocompatible properties of the lenses also help minimize deposit buildup over time. 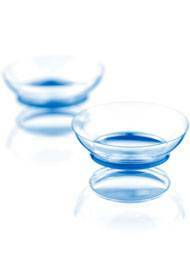 In research studies, users wearing these lenses experienced minimal swelling similar to those wearing no lens at all and significantly less redness than is typically seen with soft contact lens wear. If you are interested in wearing extended wear lenses, call for an appointment and discover if you are a candidate for these high tech lenses. For many near-sighted consumers, tempted by laser surgery but squeamish about the procedure, extended-wear contact lenses seem to offer the ideal solution. They are particularly suited to busy and active nearsighted and far-sighted patients who are tired of wearing spectacles, and unhappy with contact lens cleaning regimes. These patients may even find the routine of inserting and removing daily disposable contact lenses a chore. For all its convenience, the extended-wear contact lens has had to overcome a certain amount of bad press. The first examples of this lens, launched in the ’80s, caused some users to complain of sore and red eyes. Since then, however, great leaps in contact lens technology have given birth to a new generation of materials that offer much higher oxygen transmissibility and whose performance in clinical tests have been excellent. Like all parts of our bodies, the cornea needs oxygen. When our eyes are open, even if we are wearing contact lenses, it is easy to obtain a sufficient amount of oxygen, but when we are asleep, with our eyelids closed, oxygenation is reduced to only a third. Until recently, sleeping with contact lenses on had created another barrier to the flow of oxygen to the eye, but things have now changed. Non-stop wear 30-day contact lenses are now available. A recent research study showed that, for safe use during sleep, contact lenses must be able to transmit oxygen to at least 125 Dk level. While ordinary contact lenses have a reduced transmission of oxygen of about 25-35 Dk, 30-day lenses have a transmission of 175 Dk. Compared to normal disposable contact lenses, they enable up to 6 times more oxygen to reach the eye. Extended wear contact lenses, for up to 30 days of continuous wear, give you undreamed freedom and convenience. However, these new 30-day extended wear are different from traditional soft contact lenses because they require more diligence in areas of fit, comfort, education, and compliance.